The New Horizons spacecraft is in good health and flying farther each day. In fact, we're hightailing it through the Kuiper Belt, the third zone of our solar system, at a rate of about 1 million kilometers every day. Science never sleeps! Currently, our bird is late in a five-month-long hibernation that will end on Sept. 11. 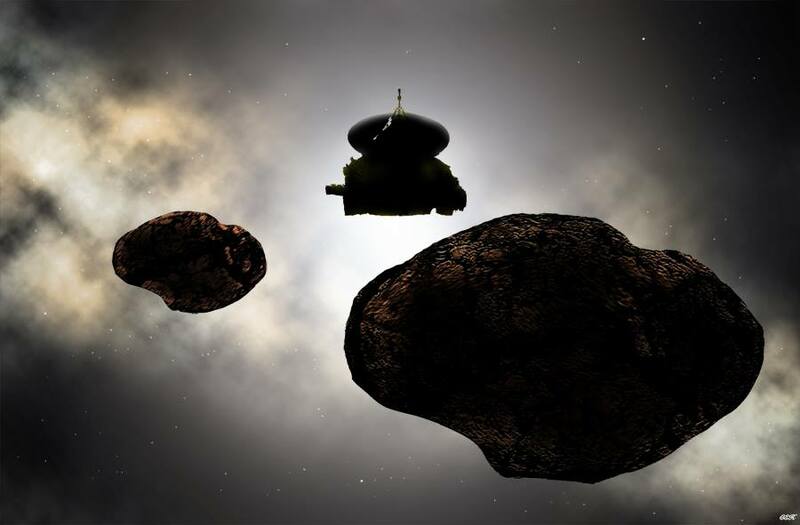 Then we'll begin a series of new Kuiper Belt object (KBO) observations, conduct some instrument tests to prepare for our approach to the KBO 2014 MU69, and undertake some annual spacecraft maintenance activities as well. In addition, we'll uplink a new and improved suite of spacecraft fault protection (also known as autonomy software) to New Horizons in early October. That is the last planned autonomy software update before our next flyby. I'm writing this during a flight home from Australia, where New Horizons Payload Systems Engineer Michael Vincent and I gave a series of Pluto science seminars and radio/TV interviews for NASA in Sydney, Canberra and Melbourne. We did four media events and five presentations in the span of four days. 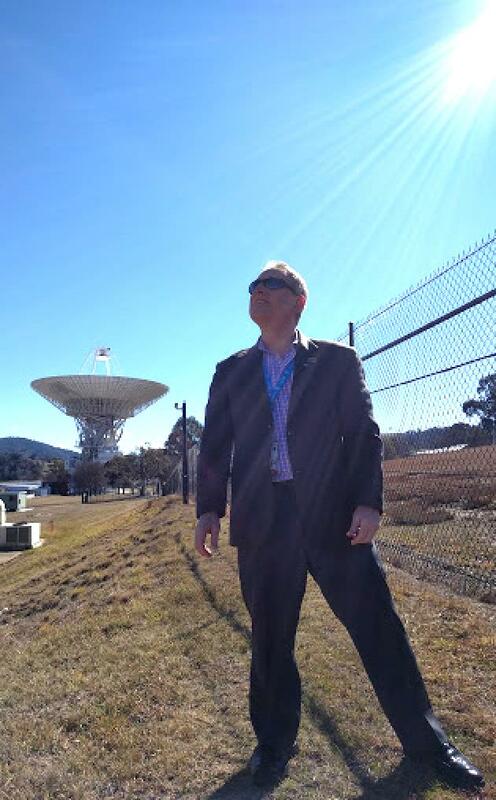 The giant, 70-meter-wide DSN dish antenna at Canberra, Australia, is behind me in this image taken on Aug. 2. Credit: Michael Vincent/SwRI. But the main reason for our trip was to visit NASA's Deep Space Network (DSN) communications station outside Canberra, in Tidbinbilla, New South Wales. That DSN radio communications station, along with others in California's Mojave Desert and just west of Madrid, Spain, is used to command, track and downlink data from NASA's far away spacecraft. New Horizons is on a trajectory that places us in Earth's southern skies, so the Canberra station's southerly latitude puts in the best place to observe, command, track and download data from New Horizons. Canberra downloaded more data from the Pluto flyby than any other NASA deep-space communications station, and it will do the same during our ongoing Kuiper Belt mission. So, Michael and I traveled to NASA's Australia communications station to meet with the technical and management staff, and to brief all the station personnel on both the Pluto results we obtained in 2015 and our plans for Kuiper Belt exploration over the next four years during our extended mission. The DSN is an unsung hero in the exploration of our solar system, and its staff ensures that the radio link that connects New Horizons (and many other missions) to Earth is always ready to enable the exploration we undertake. In addition to the many New Horizons mission planning and spacecraft tracking and monitoring activities, our team has also been busy learning some important new details about "MU69," the distant KBO we'll explore on Jan. 1, 2019 – just over 16 months from now. Learning about MU69 isn't easy, because it's very far away (over 4.4 billion miles/7 billion kilometers), quite small (just 20 miles/30 kilometers in diameter), and almost 10 billion times fainter than the eye can see. But in June and July, members of our team, led by planetary astronomer Susan Benecchi of the Planetary Science Institute, trained the Hubble Space Telescope on MU69 to see how its brightness varies as it rotates on its axis. In the three years since we discovered MU69 in 2014 using Hubble, this had never been done – largely owing to MU69's faintness, which makes it a challenge even for the powerful orbiting space telescope. But over two weeks this summer, Hubble spent 24 of its Earth orbits measuring MU69's brightness. The result was that we saw the brightness vary by less than 20 percent as MU69 turned and turned, which told us something new and important about it: either MU69 is roughly spherical in shape, or its pole is pointed toward Earth, or both. 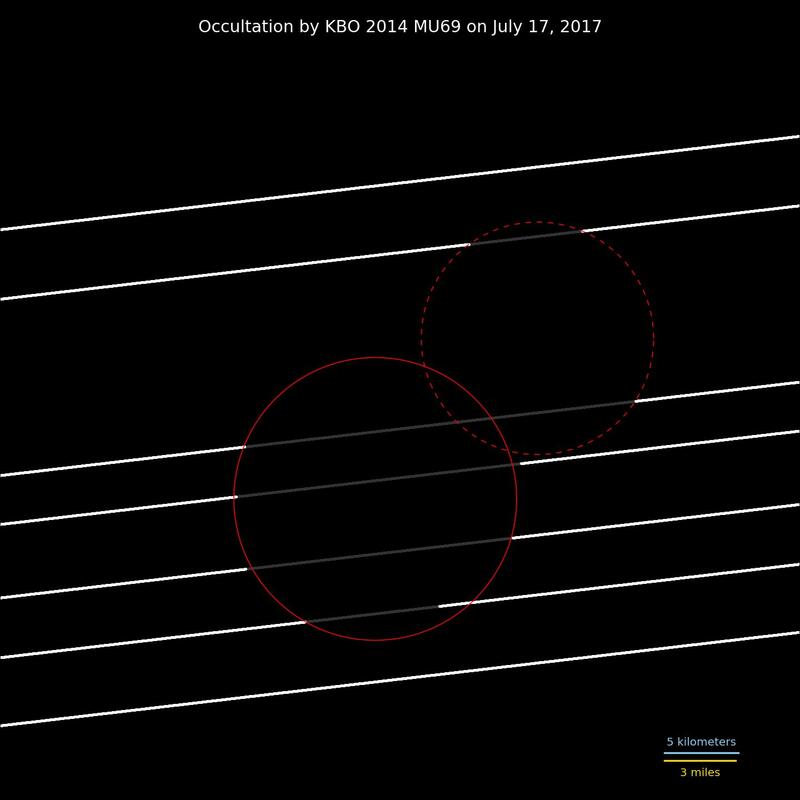 Also in June and July, we mounted a series of three campaigns to watch MU69 occult (or block) stars. These were highly challenging observations that involved placing two-dozen telescopes and NASA's SOFIA airborne observatory in the tiny, mathematically predicted stellar shadow paths of MU69. Our main goal was to search for rings or other hazards to our flyby — if they exist, we want to spot them now and aim to miss them. A collision with rings or debris at our roughly 51,000 kilometer (33,000 miles) per hour speed would likely be fatal to New Horizons. Our secondary goal was to measure MU69's size and shape, which cannot be resolved by the Hubble or any groundbased telescope, but which can be determined from how long the stars behind the passing MU69 briefly wink out. The occultation effort was led by mission science team co-investigator and Pluto expert, Marc Buie. 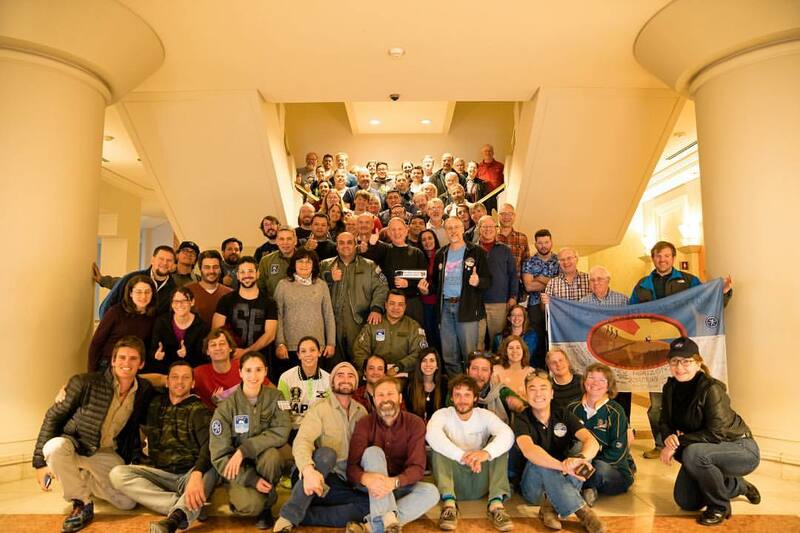 It involved more than 100 project personnel and volunteers deployed to observe in the South Pacific, in Argentina and in South Africa, where MU69's shadow raced across the Earth. It was by far the most technically and logistically challenging stellar occultation campaign in the history of planetary science – and it succeeded, thanks to Marc and his dedicated and talented team. In the end, five of the occultation telescopes spotted MU69's shadow in Argentina, and from these observations we saw the shape of MU69 on the sky that's depicted in the figure just below. The result Buie and Co. found was surprising and spectacular and scientifically seductive: MU69 appears to be either a binary orbiting pair or a contact (stuck together) pair of nearly like-sized bodies with diameters near 20 and 18 kilometers (12 and 11 miles). This means we are very likely going to a primordial binary in the Kuiper Belt, a 4-billion-year-old relic of solar system formation and an exotic building block of the small planets of the Kuiper Belt like Pluto, Ixion, Makemake, Sedna and Eris. Also this summer, we decided to adjust our flyby arrival time, making it about an hour sooner. This optimizes the viewing angles from the Canberra and Goldstone DSN stations, giving us the best chance to measure MU69's mass by tracking New Horizons, and optimizes our risky but hoped-for chance of measuring the radar reflectivity of MU69 as we illuminate it from the DSN, 4-plus billion miles away. As you can see, our team has been very busy during our "Summer of MU69," and very productive. We are learning more and more about MU69 to help plan our flyby. We are also pinning down the exact arrival time to optimize the flyby science. This fall, after New Horizons emerges from hibernation, we'll craft the MU69 flyby observation plan in exquisite detail. We'll also make more science observations of distant KBOs, and we'll be continuously measuring the Kuiper Belt's radiation, dust and gas environment. Near the end of this year, on Dec. 9, we'll fire our engines to trim our course to and optimize the arrival time at MU69 as I described earlier. Then New Horizons will enter hibernation one last time, before the MU69 flyby begins late next summer. New exploration awaits us, at the very frontier of our solar system – late in 2018 and early in 2019, both of which are almost around the corner! For more mission news, stay tuned to NASA websites, our own project website and our social media channels, listed below. I'll write again in the fall. Until then, I hope you'll keep on exploring – just as we do!